King 72” Vertical Turret Lathe s/n 1205 w/ 78” Swing, 1.44-47.8 RPM, (2) Facing/Boring Heads, 72” 4-JawChuck. King 52” Vertical Turret Lathe w/ 64” Max Swing, 5-Station Turret Head, Facing/Turning Head, 2.25-72.1RPM, Intermediate Speeds Thru Rheostat, Power Feeds, 52” 4-Jaw Chuck. Bridgeport Vertical Mill s/n 95187 w/ 1Hp Motor, 80-2720 RPM, Chrome Ways, 9” x 48” Table, Bridgeport Shaping Head. Pehaka mdl. HSE250 10” Horizontal Band Saw s/n 32322/PO1800 w/ 3-Speeds, Manual Clamping. Powermatic mdl. 87 20” Vertical Band Saw s/n 4-4181 w/ Blade Welder, 24” x 24” Table. K.R. Wilson mdl. 37FX 75 Ton Hydraulic H-Frame Press. Square Wheel 2” Belt Sander. Giddings & Lewis Type 70-E4- T Horizontal Boring Mill s/n 400-142-68 w/ 6.9-1320 RPM, Inch Threading, 4” Spindle, 48” x 86 ½” Table, Power Feeds, 24” Facing Head. Lucas “No. 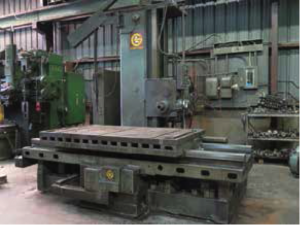 42 Precision” Horizontal Boring Mill s/n 42-26- 4 w/ 9-255 RPM, 4” Spindle, 40” x 60” Table, Arbor Support, 93” x 3” Boring Arbor.